Since it was founded in 2000, Propertybuyer has become the most awarded buyers' agency in Australia, most recently crowned the 2015 Buyer's Agent of the Year by Your Investment Property readers. The independent agency's team of 12 specialise in searching, appraising and negotiating property purchases for home buyers and investors. To date Propertybuyer has helped clients from Australia and around the world purchase more than 2,000 residential or commercial properties in their specialist areas of Sydney and Brisbane. Founder and Managing Director of Propertybuyer, Rich Harvey, knows the real estate market inside out with more than 20 years' experience in the property industry. He is a licensed real estate agent, property investor, professional economist and President of Real Estate Buyers' Agent Association. "We don't sell homes we only help buyers find property, whether that's residential or commercial," says Rich. "As independent buyers advocates, we are 100 per cent exclusively on the buyer's side. We conduct a property search in suburbs that suit the client's criteria and lifestyle, identify the property and then negotiate the contract and secure the property on behalf of our buyers, including all the appraisal work." "It's really an end-to-end service for buying any kind of property. Our goal is to find every client the right property, at the right price, every time". While traditionally vendors have been well represented in the real estate market, Rich founded Propertybuyer because he could see buyers needed greater support and professional advice when making a purchasing decision. He says buyers should choose a trusted team of service providers to help them make what is usually the most expensive purchase in their lives, safe, secure and efficient. "The two key people you need to have on your team as a buyer is a good bank or mortgage broker and a good solicitor." "Let's say you choose an old suburban cardigan wearing solicitor who still struggles with the Internet, they're not going to be able to get a deal done for you. But if you use someone that's smart, savvy, understands the law and can go through a contract in detail, whilst quickly corresponding with the other side to get amendments done, it makes the process so much easier and efficient." "As a buyers' agent we're very intimately involved in the conveyancing process," Rich explains. "Part of our process is to check that correct due-diligence is done on a property. So we recommend our clients engage a conveyancer or solicitor to handle the contracts, check all the title particulars and negotiate with the vendor's solicitors if there are any special requirements or conditions that need to be arranged." "It's critical for us to have a solicitor that's responsive and quick to move. It can make or break a deal." 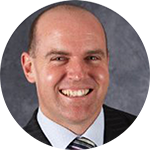 With many Propertybuyer clients new to real estate or investors from interstate, Rich estimates about 40 per cent of his customers don't have a preferred property lawyer to handle their conveyance. Rich knows his recommendations are highly valued by clients so he is conscious of only partnering with trusted service providers. "If you refer someone you want to know they are going to be looked after and a good job is going to be done," Rich says. "We have relationships with a number of service providers, finance brokers, tax accountants, tax depreciation specialists - a whole raft of professionals - and conveyancing is a really critical service that we recommend to our clients." Propertybuyer have been working with Lawlab for 18 months, in which time they have helped clients from Australia and Asia secure their property purchases. Rich says the Propertybuyer team have enjoyed a productive relationship with lawlab, which has been powered by the use of online property platform, Rundl, which lawlab use to streamline communication between all parties in a property transaction. Rundl puts buyers in complete control of their purchase and enables their property team of buyers' agents, mortgage brokers, accountants and financial institutions, to collaborate and securely share and approve documents efficiently. I really love their Rundl system and the team's responsiveness. They've been very timely and very efficient. The Rundl platform not only lets agents monitor their clients' transactions, but it sends email alerts and notifications when key milestones have been met. Speaking from a buyers' advocate perspective it's excellent because it keeps you in the loop every step of the way. It saves you from heaps of repetitive phone calls because everyone has communicated online and there has been a trail of the conversation left behind on Rundl. "Let's say you're buying a property in Queensland, there is usually a 14 or 21 day finance clause. So the buyer will put down a $1,000 deposit to have the property taken off the market and then the balance is due in 14 or 21 days' time. So Rundl will send a reminder a few days before saying that the balance is due and to make arrangements to deposit into the appropriate account." Propertybuyer's advisors specialise in the Sydney and Brisbane property markets, but also have a network of contacts all around Australia to help find their clients the perfect property. Because each state and territory in Australia has its own laws and conveyancing processes, Rich says it's essential his clients engage a lawyer that has experience with local property laws. "If you're buying interstate, a lot of people don't realise you need to use a solicitor that is licensed in that state," Rich explains. 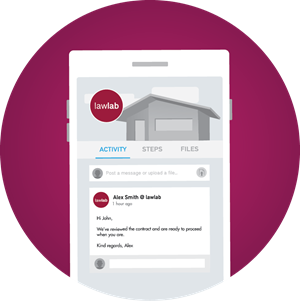 "Because they're licensed in other states it's easy to refer clients to Lawlab. They have national coverage and have specialists in each state that know the local laws and regulations, just like we do." Many Propertybuyer customers haven't been through the conveyancing process before, so they don't even realise that lawlab and Rundl is saving them the time and effort usually required. Rich says he has actually had very little feedback from clients on the lawlab system, which he thinks is an excellent sign of a simple and seamless system. "Seeing the comments going back and forward [over Rundl] it seems clients have embraced the process." Because Rundl is used much like a social media, but for business, Rich said that most people are already familiar with how to use the platform and that there wasn't really any training required for his team or Propertybuyer clients. "It's pretty straight forward honestly. It's just like downloading Adobe and learning how to read a document. It's not like a whole new dashboard to learn so it was really pretty straight forward."